OK let me just start by saying, I hate to give the application of this polish a poor rating because I really LOVE the polish. But... I don't want to lie to you. I will discuss application in more detail shortly. 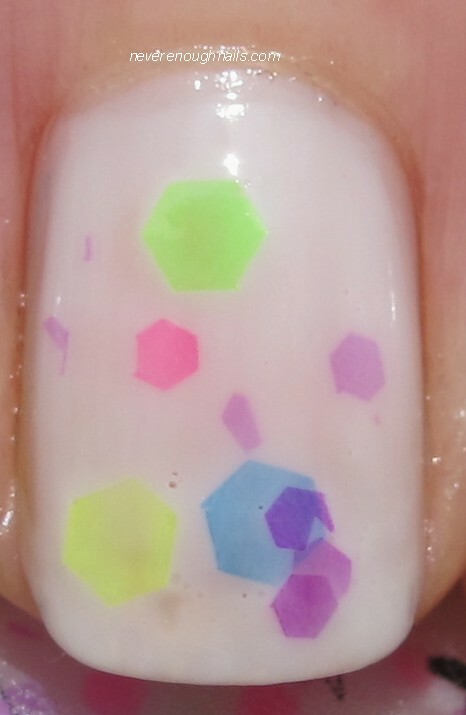 Jindie Nails Candy Land is a fun white jelly base with neon hex glitters in assorted colors and sizes. I absolutely adore the look of this and I also love the name! The glitters are really pretty neon shades of green, yellow, purple, pink and blue, and in the white base, they remind me of Funfetti frosting (just the best frosting on the planet). Now... down to business. If you just apply this polish in regular brush strokes, you will not get very many (if any) of the pretty glitters on your nails. If you try to dab this polish on to get the glitters on your nails, the white base looks uneven. The glitters tend to sink to the bottom, and even after I had this upside for 30 minutes, the glitters really didn't want to come out to play. Based on this experience, I had to give Candy Land a poor application rating. HOWEVER, if you're like me and you want to wear this polish anyway, I have some tips. You should start by applying two regular brushed on coats of the polish and concentrate on just getting the coverage you want from the white base. Don't worry about the glitter yet. After those two coats are done and have dried for a minute or so, load up your brush with as much polish and glitter as possible. Then, wipe the glitters off on the neck of the bottle. Wipe off all that excess polish from the brush, and then use the brush to pick up those glitters you just put on the neck of the bottle. Place glitters on your nails. This method is definitely a bit tedious, but that's what I ended up doing to achieve the look you see here. So this is kind of three coats of polish. My final verdict? I love and will still wear Jindie Nails Candy Land. It takes a little effort to achieve the look I want, but it's so worth it in the end. I think you could also layer this over a white creme or jelly base, so that you can just focus on applying the glitter, rather than trying to get some coverage too. Jindie Nails is restocking on jindienails.com sometime between April 15-20 and will be selling her gorgeous new spring collection then too! Check out her Facebook page for more info. Great technique! I've had the worst time with Rave for that exact reason. I will try that out with her polishes next time. Definitely give it a try! It works a thousand times better than trying to apply it normally. It doesn't take too long when you get used to it!